The Tom got kind of a dirty rep, and over the years as inflation brought the value of the single and the two closer together it became even less necessary. Folks didn’t see much use for poor ol’ Tom, and in 1966 the government decided to stop making it. Ten years went by with no twos. In 1976, the Treasury decided it would take another shot at the $2 bill. It would order the Bureau to print a special bill for the country’s bicentennial, with a big picture of the signing of the Declaration of Independence on the back. My brother-in-law, Tom Achey, came of age during the Nixon, Ford, and Carter administrations. He still has the same haircut from 1976. And something else from 1976 that he recovered just last week. He went to buy cigarettes at a local store and was handed change. 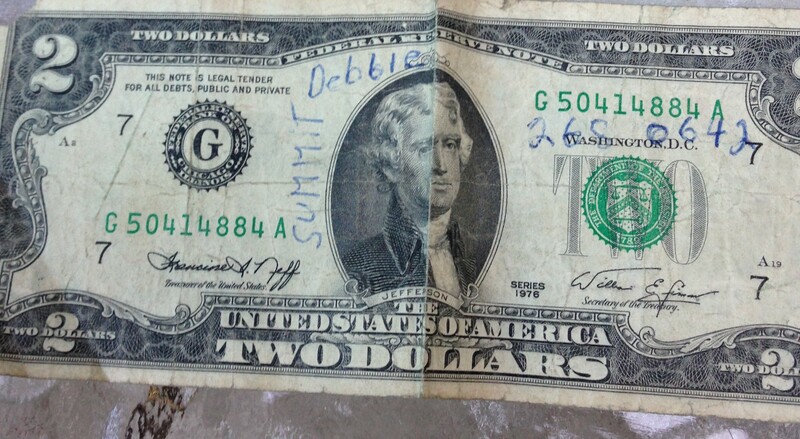 As he walked out, he glanced down at a $2 bill. There was writing on it. He looked closer and saw the year, 1976. It looked like his writing. Tom had met a pretty blonde in 1976, and asked for her name and phone number and street address. He married her. Forty years later, they still are married and live in the same town in New Jersey. What happened to Summit? The house on a dirt road without an address number, only a street name, was later given the number 60, and a paved road now fronts the home of Debbie Mason Achey’s youth. Debbie’s mom sold the home a couple of days ago to a nice couple with a boy. His name is Mason. And now Mason will roam the same halls of 60 Summit Drive which holds 45 years of memory for a family of Mason’s, many called Tom. And the patriarch, Thom Mason, looking down knowingly, perhaps planted the $2 bill, and the kid named Mason. It makes one stop and think…and pay attention to the currency of your life. next one. You are a great writer.